Caribou Cards, 2010, 50 game cards prompting thought, action, and group participation. 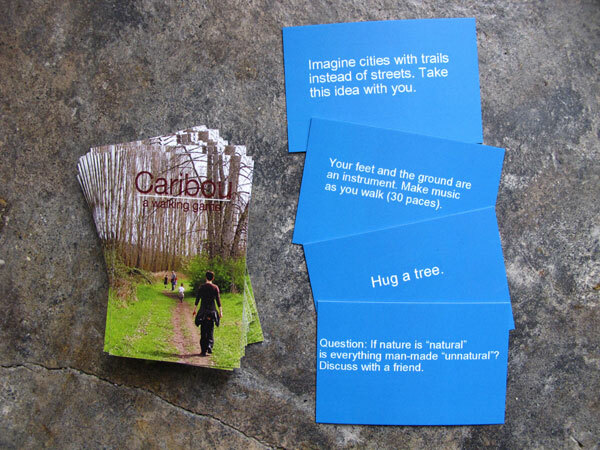 Part Yoko Ono’s Grapefruit, part homage to Richard Long, and part love affair with the connection to community walking helps develop, Caribou Cards are a set of 50 game cards offering prompts / prescriptions / new ways to experience taking a walk. Over 75 participants gathered to play the game together during a special event in May 2010 on the Soos Creek Trail in Kent, WA.